François G. Dorais answered how to log out from this site. I want to mention a complementary point that is not strictly related to this site, yet I feel it can be quite relevant in practice. Logging in to MO via Goggle, will be a login on one's Google account. Logging out from MO however, will not logout from Google. Thus, usually one needs to logout from Google separately. In particular, if one does not, clicking "login" on MO and then the "Google" button will login to MO without the need for a password. I used Google as a common example, but it should not be only relevant for Google (yet I do not know the details of all the identity-providers). If one is in an environment where one stays logged in to Google, usually there should be no need to logout from MO either. Conversely if one is an environment where one will want to logout after finishing the session. It can make sense to start the session in "private" mode in the browser. Then, at the end just closing the browser will also close the session on MO (and Google). Right now (December 2018), the answer is: there is a striped "speech balloon" icon on the top right of the page, and clicking it will reveal a menu with a "log out" link. I imagine the answer to this question may continue to change over time, as Stack Exchange continues to redesign the user interface. 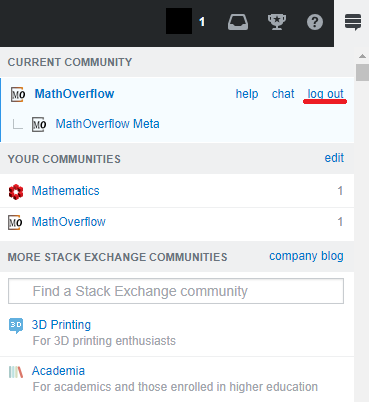 The current answer can be found at this page: How to log out of a Stack Exchange site? and I hope it will continue to be maintained. Not the answer you're looking for? Browse other questions tagged support user-interface user-accounts login .